A family owned trophy shop, established in 1978. 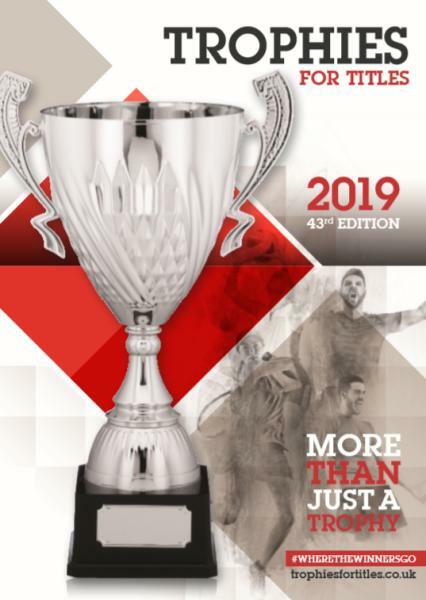 Offering Lancashire's widest selection of trophies and awards for every occasion, including our own popular range of natural slate and stone trophies and gifts. 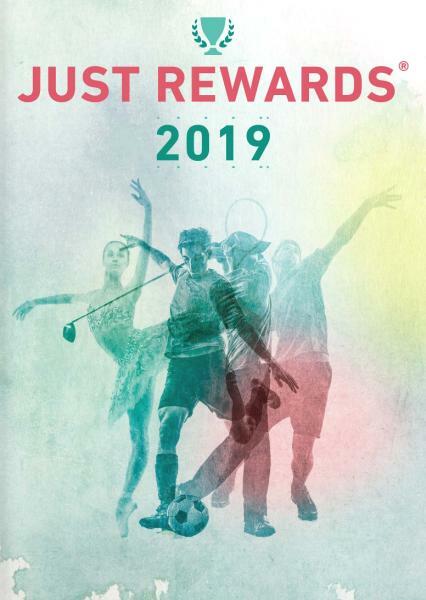 Whether you're organising a sports tournament, planning a corporate event or looking for that special anniversary or retirement gift, we'll guide you in the right direction. Proudly independent since 1978, you can rely on us for impartial advice on the best trophies for price and quality. Click on the images above for the catalogues of some of our suppliers. Providing a full engraving service for shields, trophies, medals and more, with discounts for items purchased from ourselves. 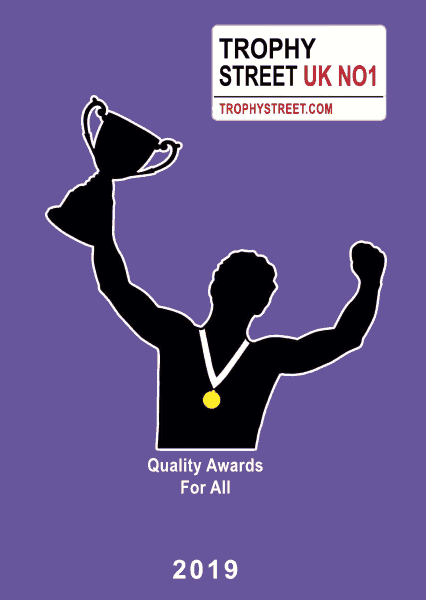 Bring your club's annual (perpetual) trophies to us and we'll engrave them for you. We always engrave with a diamond, onto anodised aluminium plates, unlike other shops printing onto cheap peelable foil labels. 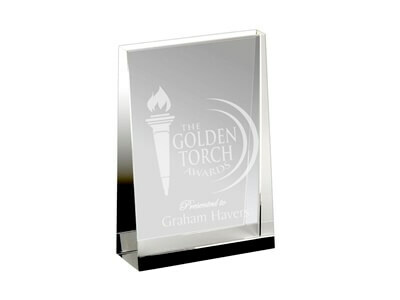 Specialising in glass engraving, for personalised glass, corporate awards and golf trophies, also engraving designs and logos onto our own exclusive range of stone trophies and gifts. Our glass etching is performed expertly by sandblasting rather than by unsuitable laser, chemical etch or diamond engraving methods. Our CO2 laser engraving machine is ideally suited for wooden plaques and signs, including plywood, MDF, bamboo and more. 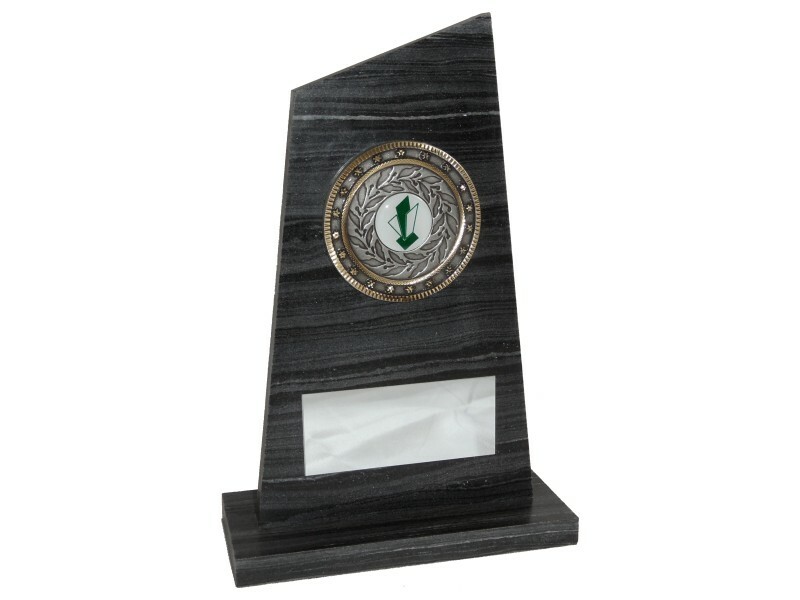 Additionally, lasering can provide a cost effective alternative to sandblasting for coasters, placemats and small trophy plaques, with excellent results on our economy black and silver slate ranges. We would like to extend a warm welcome for you to visit our new showroom. More spacious (twice the size as before), and with better natural lighting, you're sure to find the trophy you want. Photographs will be coming later, after Sam's mum has been in to grant her approval. We promised her she would see it first, sorry! After a successful trial period with our new laser cutter/engraver we can now offer laser engraving on slate trophies, place mats and coasters, clocks and hanging signs. 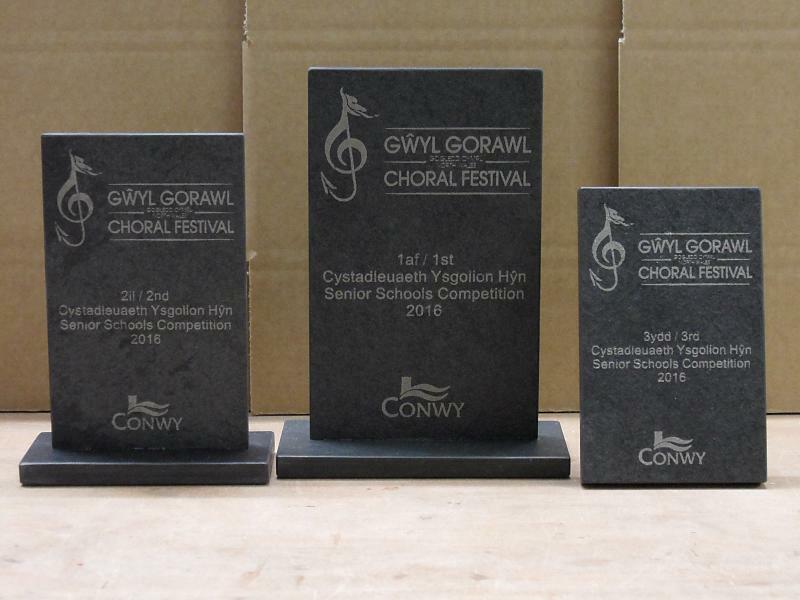 The photograph shows a sample set of awards for our first order, for the prestigious North Wales Choral Festival. Last week a customer returned one of our 1980s Westmorland Slate trophies that had been in storage for 20 years, hoping we could give it a fresh lick of paint, or something like that. We were delighted that one of John's original designs had survived, and quickly donned our thinking caps to come up with a renovation plan. Five and a half hours of cleaning, sanding, sandblasting, painting, polishing and engraving later and the trophy has now been brought up to date, ready for another 30 years' service. We are pleased to announce that we can now offer in-house sandblasting, personalising glass with your own designs and logos. Our customised glass and trophies are ideal for corporate gifts, or presents for birthdays, anniversaries, retirement gifts, weddings and engagements. Please contact us now to discuss your ideas and requirements. Look who won one of our new bespoke dog agility trophies at the Wyre Agility 2016 spring show. Wow! 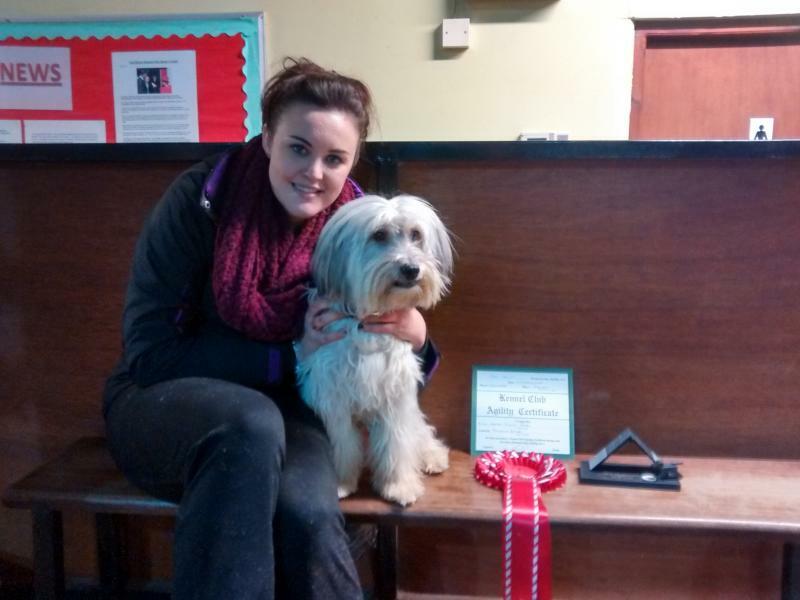 Congratulations Ashleigh and Pudsey, and good luck for Crufts next year! We were recently commissioned by Great Harwood Gym to design a bespoke Strongman trophy for the Summer Giants 2015 Strongman competition. A bit of quick thinking and a lot of hard work later and we had designed our own deadlift trophy. Please head over to Maden Britain to see the end result. 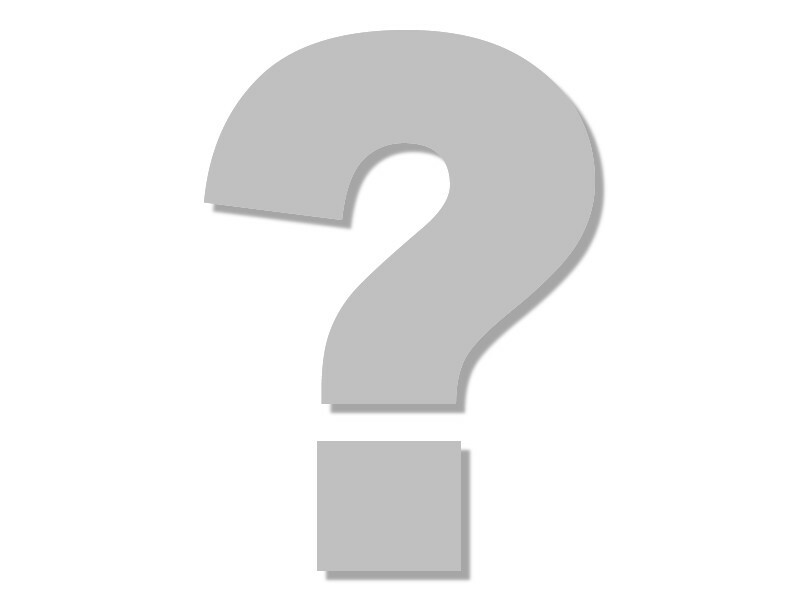 Modern Times: Weekend Warrior, "Tough Mudder"
We've been keeping quiet about this for months now. Last year we were approached by the BBC if we would like to be involved in a new documentary following "Tough Mudders", the participants in an extreme assault course. It goes without saying we jumped at the chance. When the day came, Sam, Paul and Vivien all got stage fright and John was thrown into the limelight. 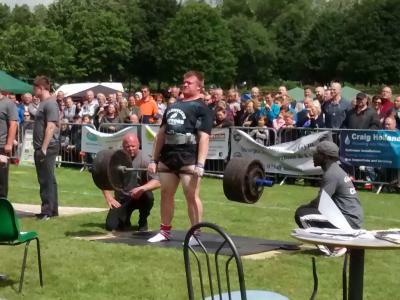 We think he did brilliantly. Even if we were peeping round the door trying to put him off! 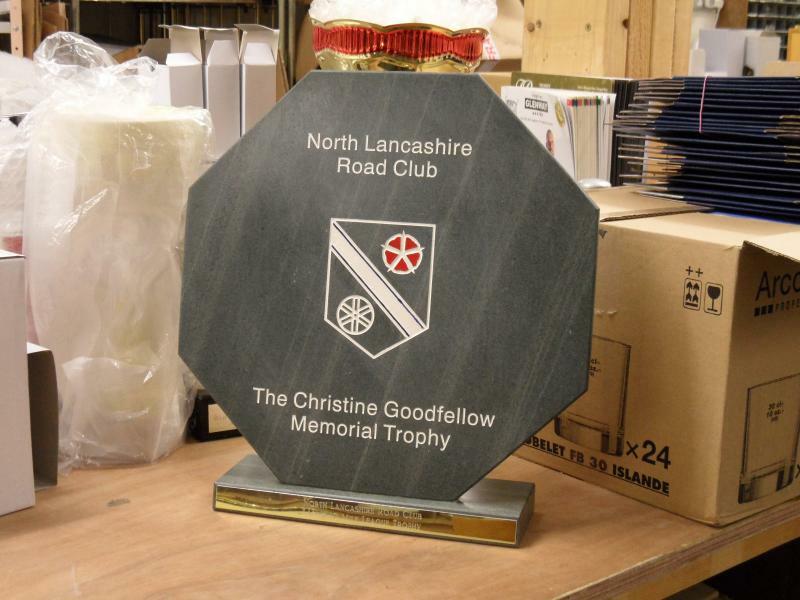 This lovely trophy shown here is one of our new range in slate and natural stone. Its arrival is significant as it marks the beginning in a new chapter for us. Paul has finally taken the plunge and decided to join the business, allowing us to expand our corporate and bespoke range. Please visit Maden Britain to see our latest trophies and some of our more wonderful creations. 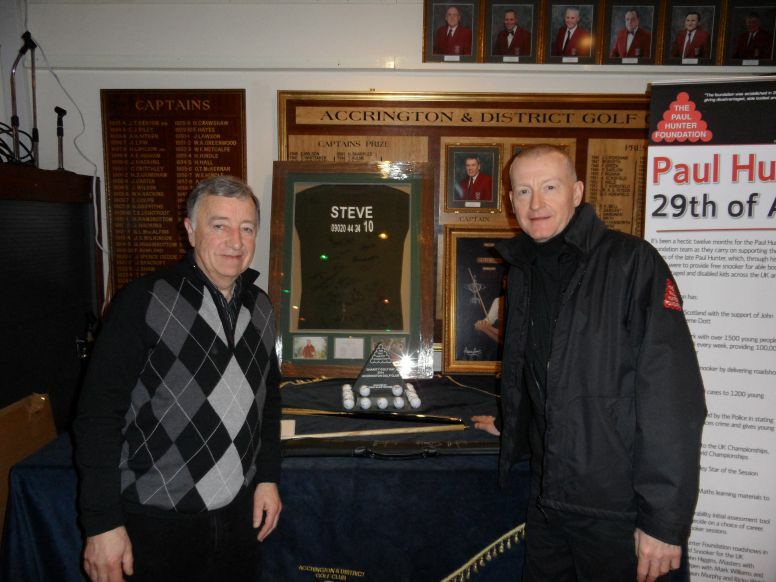 John and Steve Davis with our custom trophy at the Paul Hunter Foundation Charity Golf Day. This was one of our first bespoke trophies, and we are happy to say it sold at auction for a total of £400 towards the Paul Hunter Foundation. The trophy includes the match balls signed by the participants, including eight world champion snooker players with 17 titles between them. Please phone us or pop in for a chat with Sam or Paul about your requirements. We'll never put you under any pressure, and may just surprise you with the perfect something for your presentation. Struggling to make time? Early, Evenings, Weekends and Bank Holiday appointments are available. Our new address as of April 2013 - We have moved from Derby Street, down Trafalgar Street, round the corner and are now above Gaz's Outdoor Warehouse. Free parking directly across the road. Thanks for visiting our site, we hope to see you soon in our shop! Best wishes from the Maden family.